First Line: Five minutes into this ridiculous escapade, and already Scott McFarlane thought it was a bad idea. Alison Kerby has her old Victorian guesthouse on the Jersey Shore up and running. A company offering "unique" vacation experiences to senior citizens has agreed to book rooms there-- as long as ghosts make twice daily appearances. Alison isn't giving much thought to that private investigator's license she got at the urging of one of the resident ghosts. After all, she pretty much solved any mysteries on the premises. However... she doesn't take into account that other spirits may get in contact with her resident P.I. ghost to ask for help. That's exactly what happens when in floats the deceased Scott McFarlane. McFarlane was hired to scare a prominent local business woman, but he's worried that he actually killed her. Why doesn't he know if the woman's dead or not? Scott McFarlane is blind. Copperman (AKA Jeffrey Cohen) had me laughing from the start with Alison's trial by fire in the hospitality industry. If you've ever had to work any sort of customer service job, you're going to recognize every one of Alison's guests. When she decided to take on the entire cast and crew of a reality TV program as well, I shook my head. Yes, I shook my head. Copperman writes the type of characters that get you involved. I even like the local police detective in this one. McElone has a lot to deal with-- especially since she doesn't believe in ghosts-- and I think she handles Alison and her crew rather well. 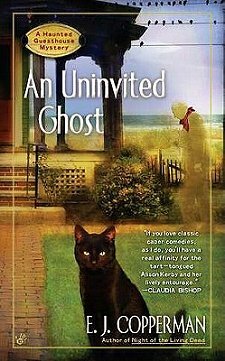 The only letdown in An Uninvited Ghost for me was Scott McFarlane. It is rather daring to have a blind ghost as a character. In his Author's Note at the beginning of the book, Copperman tells us that one of the nice things in having ghosts as characters is that there are no rules; you can make them up as you go along. Unfortunately McFarlane's blindness seems to come and go throughout the book. Several times, he would do something that would make me stop and think, "Hey, wait a second. Isn't he supposed to be blind?" Make up all the rules you like, but please be consistent, too. That was a minor letdown, however. I enjoyed this visit with Alison, and I'm looking forward to seeing what else happens in that haunted guesthouse of hers. An Uninvited Ghost at Amazon. An Uninvited Ghost at The Book Depository. An Uninvited Ghost at Your Favorite Indie Bookseller. I hope you get a chance to read that book soon, Shelleyrae, I loved it! When I went to see Deborah Crombie at The Poisoned Pen, I had to buy some books (natch! ), and OLD HAUNTS was one of the books that came home with me. I'm looking forward to reading it, although some of your other titles may get read first. I having a difficult time keeping up with you, sir! Cathy - That guesthouse setting does it for me! What a great context for a mystery! I need to check this out. It's a very good series, Margot!